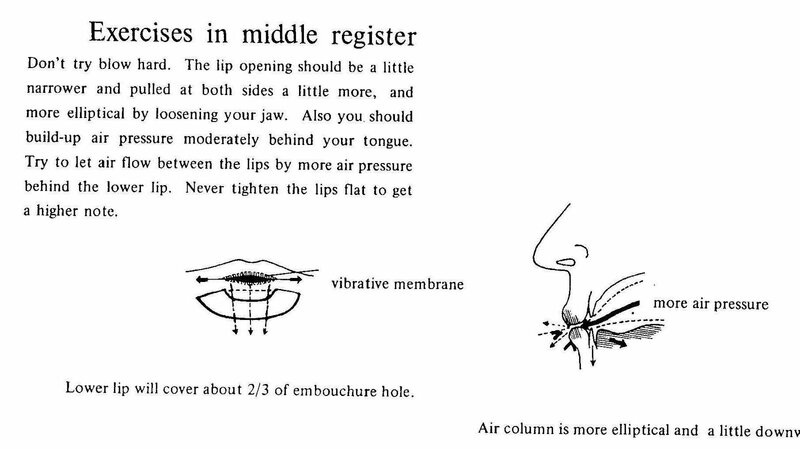 This topic is also very well covered in Roger Mather's Volume 2 of "The Art of Playing the Flute" when Mather talks about lowering the pressure of the flute's chin-plate in order to allow freedom to the lips to vibrate as the air reed passes through them. 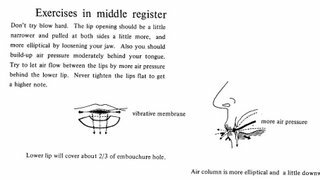 I think that the common mistake is for student flutists to squeeze the red lip tissue itself, often with the bottom lip being trapped by the metal chin plate, and the upper lip pulled too tightly across the teeth. 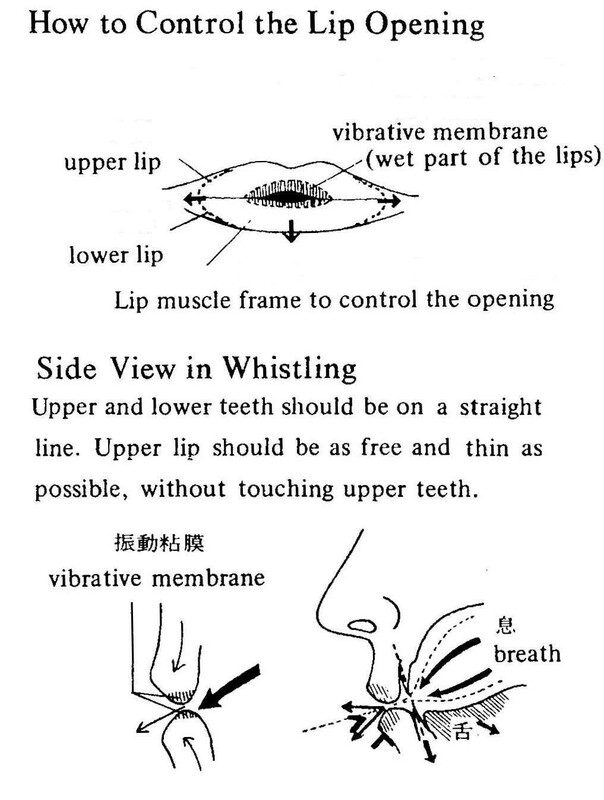 Both these mistakes cause too much of the dry outer portion of the lips being used to direct the air stream, instead of the inner membrane of the lips, which actually is a much finer control. We want to be sure we're using the muscles that surround the mouth (the 2 inch area that surrounds the lips in a 360 degree circle, but not the lips themselves) to form the lip shape. Using the muscles of the face that surround the lips allows the lips themselves to stay flexible, free and loose enough to form a longer "barrel" or tube for the air to flow down before it leaves the mouth. In lessons I ask the student to allow the inner membrane to be blown to the exterior as when saying a slightly explosive "PEU!" or "Poooooo". This gives them a longer lip tube to direct the air with to find the sweet spot of the best tone, and also eventually leads to effortless leaping between low and high notes. Very interesting, but very complicated. 2. Upper lip should not touch front teeth - good advice, I am working on that. (The Mather book II is great, by the way!). 3. Many things which are described in detail here remind me of - what I think - my buzzing and chopstick exercises are leading towards. Maybe I develop a vibrating membrane - hahahaha - so I do not need a plastic surgeon? Brasil - Thanks for sharing. volume I. I think Takahashi and Moyse collaborated. My lower lip is slightly thicker than the ideal and I get a better tone when the flute hole opening is a bit higher than the usual level of most players who have thinner lips. 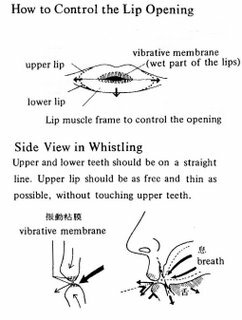 While this improves the sound, it also results in a declined stability (the support of the chin is diminished), as a result I tend to press my lip with the flute especially in the high register. Thus I get a bad, squeezed tone. I have been playing for slightly more than a year and recently we realized with my instructor that this habit was preventing me from enhancing the tone in the high register. 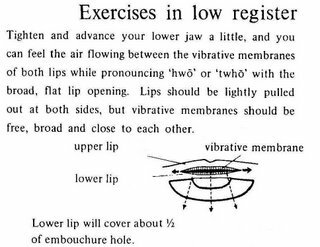 Now I am trying to shape my lips into the form that you have explained in Moyce's drawing. But I guess the muscles are still weak and after a while they start trembling and there's too much tension build up especially in my upper lip. Menstruation periods worsen the situation further, probably as the muscles around the diaphragm become loose. I find myself blowing harder and harder with constantly increasing lip pressure and headache. No matter what I do to relax I cannot succeed. As a result nowadays there are some weeks during which I cannot improve the sound no matter what, I just have to wait for the tension to go away. Even my instructor recommended me to have a break for few days. What I want to learn is, if there are any exercises to help ease the tension and adapt the true relaxed embrochure more easily. Recently I have been practicing scales from Moyse's Ecole De L'Articulation to correct this but they don't always help. I was recommended to stop practicing the longtone sonorites as they also seem to tihgten my lips. It's difficult to advise you at a distance. If you're "trying too hard" and if you're getting aches from tension, then for sure, it is far far too much tension. When we first start to find the right muscles, we tighten all the neighbouring muscles as well, in our efforts. So instead of "tightening" you need to relax every muscle that is NOT needed. That takes time and focus, and much relaxing in between. On a scale of one to ten, with ten being maximum tension, you need to find a "two or three". Part of being patient is also spending time on things that ACTUALLY help. For example, if tension is a problem, typically, for you, you could investigate what relaxing 100% feels like. Invest in a professional massage and relax 100%. Then use what you learn when you return to flute practice. 3. Working systematically with specific self-teaching exercises to lower the pressure of the flute's lip plate so it doesn't distort the lower lip. 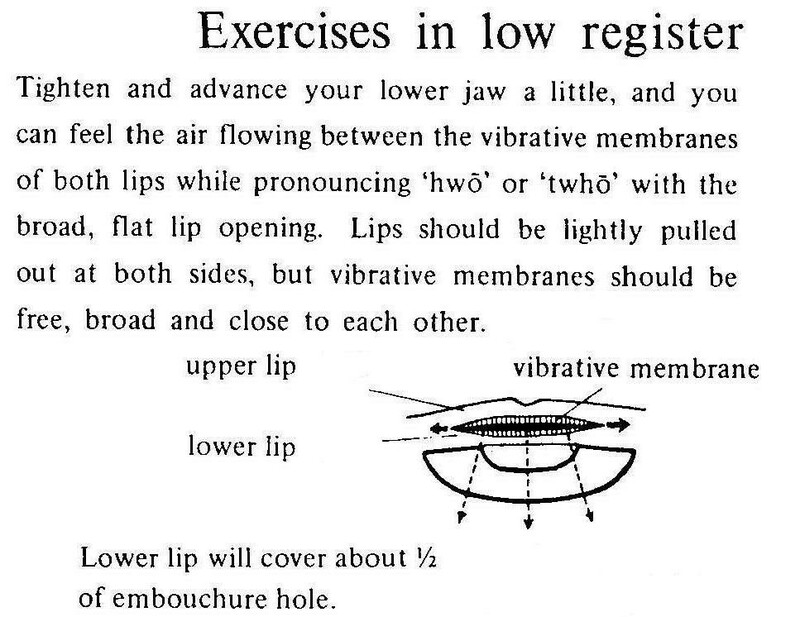 These exercises are in Vol. 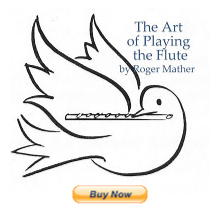 2 of Roger Mather's "The Art of Playing the Flute". 4. Reducing tension overall by improving the ease of breathing. Look into Alexander Technique and also "The Physical Flute" by Wilkinson. It could be your tension is actually caused by the way you hold your whole body. When you take a break from tense flute playing, you can ALWAYS do self-relaxing imagery and other things with your time. Let me know if you have a break-through, if you do. I'll be curious what the problem truly was.